So many ways to get involved! What’s your passion? There’s no better way to get connected than to get involved. And whether you’re interested in service, spirit, a specific pursuit or just plain fun, we’ve got you covered. Make the most of your educational experience by exploring the full range of offerings on campus and beyond. We offer 90-plus student orgs, leadership-development programs, service opportunities and on-campus employment though internships. Take a look around and find something that’s right for you – or create your own student org! 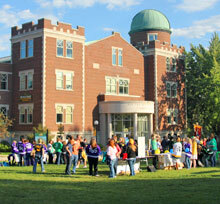 View our complete list of student organizations to see what interests you. Then, get in touch with the student organization contact on that webpage to find out how you can get involved. The easiest way to find out about all the activities we have to offer is by attending the Taste of SNC involvement fair during the first week of classes.